In a major victory for Right to Information in Sri Lanka, the Cabinet of Ministers released the full report of the Cabinet Committee investigating financial irregularities incurred during the construction of Sri Lanka’s Defence Headquarters Complex (DHQC) in Akuregoda, together with annexes, appendixes and attachments following an appeal hearing at the Right to Information Commission this Tuesday (2nd April). The committee had been appointed in terms of Cabinet Decision dated 05.08.2015 (No. 15/1131/603/045) ‘to investigate and make recommendations’ on the financial irregularities concerning the construction during the time of former President Mahinda Rajapaksa. The release was in response to an appeal filed by Thirukumar Nadesan whose request for the documentation had been refused by the Cabinet and state entities on the basis of national security. Also released was Cabinet Decision dated 05.08.2015 (No. 15/1131/603/045) to investigate and make recommendations on the matters related to the ‘consultancy firms and related payments’ of the project on the construction of the Defence Headquarters complex (DHQC) in Akuregoda. Saying that the information asked for concerned financial irregularities and if any documents affected national security, they could be redacted from the information handed over, the RTI Commission had ordered that the report be released under confidential cover to it. The Cabinet of Ministers had agreed to hand over the report in line with the ruling. After prolonged hearings before the Commission where the basis for rejection of the information had been examined at length, the Attorney General had indicated to the Commission on Tuesday that there was no impediment to the release of the information. Upon being directed to indicate if national security impacted on the release, the Ministry of Defence also informed the Commission that it had no objection. Following this, the information was released to the Appellant Nadesan. Also released were details of money paid to Muditha Jayakody Associates (Pvt.) Ltd and Muditha Jayakody in regard to the project on the construction of the Defence HQ Complex in Akuregoda in the period 2011 to 31st May 2015. Reporting on the information release, the Daily Lankadeepa this week hailed the release as a landmark step for RTI, pointing out, in a report filed by senior journalist Tharindu Jayawardena, that Public Authorities should realise from this example to be more careful in raising national security as a ground to refuse information without any actual basis and should understand that information can be refused only in respect of clearly spelt out reasons under the RTI Act. The irony is that a magnificent hotel with 500 rooms and 41 apartments now stands on the land that was sold in 2011 to build these ghastly, ghostly, grey structures. The land at galle face was sold for $125 million which converted to Rs. 19 billion. In 2011 the government obtained parliamentary approval for Rs.20 Billion for the project to be completed by 2013. It is reported that the project was launched at an estimated cost of Rs. 8 billion (another report says stage 1 was estimated at Rs.40 billion!) but Rs. 64 billion has already been spent (56 billion in excess!). While another Rs.100 billion is needed to complete the building! In the meantime we are told that the forces have been accommodated in 15 rented buildings at an annual cost of Rs.5 billion (5000 million rupees). This means the treasury pays up Rs.416 million a month for rent since 2012? Rs.30 billion+ so far? Has poorly researched and unbelievable information been disseminated to us by the government and the media. Or can all of this really be true? The links to the newspapers that published this information has been listed below. Firstly, all of us who have built houses know that the first thing you do is to get a Quantity Surveyor to prepare a BOQ based on the plan. So it is obvious that the estimated cost of Rs.8 billion (if correct) was based on this. Can it make any sense that the cost can escalate by 20 times the estimated amount (by Rs. 156 billion)? Who prepared this BOQ? What was the actual plan and cost for housing the forces until completion? Was it a good idea to hand over the construction to the tri forces instead of a reputable construction company with a contract connected to the final cost for completion? Simple pertinent questions. The actual project cost is no different than what is experienced hiring a “Bass” to do a home renovation. They will give a low ball estimate to get the work and the true cost to complete will be much more than original quoted not to forget the time delay. Hope this information will be published in Sinhala daily’s to educate the masses but then what impact could it have on the majority whom are dumb and thinks that Gota and boys are the only saviors of the country. GR as person who has lived and worked in US should know better to handle the project costs unless “Bass” strategy was adopted to get the proposal passed in the parliament. If this is the way country’s economy would be managed if he ever becomes the EP then god save the country and posting you tube videos to show that that he could also sing with a group of jacketed friends won’t help. In SL contracting is a lucrative business like winning a lottery provided that the contractor has access to VIPs. If not mistaken the construction contract went to company owned by an Ex. Army Captain. What pentagon type HQ in SL (unless someone wants to pump their image using public funds like the father’s memorial) when people are struggling to have one square meal a day. There is an interesting piece of video on youtube where during a budget debate SF expressing the dissatisfaction of Army personal for having to give up former and now left without a HQ. Woah! Cabinet gives way to an RTI order! Yes, perhaps this will happen until next Presidential election, depending who gets elected? SLPP, UNP or SLFP candidate! Sri lankan govt is going to buy REMOTE SENSING and RADAR Equipment for NARCOTICS surveillance from unknown companies. For me, it looks like Good commis when the election is near by and the company may be another BELIMISSA. RADAR and REMOTE SENSING available even in INDIA, CHINA too and that may be cheaper. I heard Maithripala Sirisena saying He doe snot know much but Ranil says buy it from that offer. Probably, Maithripala Sirisena is trying to make a deal with those countries. I am giving business to your companies too SO LEAVE ME ALONE. Metropolitan Group is involved in this deal…what is the connection? Why is that anything proposed by the military is accepted/implemented without feasibility/necessity studies? In the latest budget, a colossal amount is proposed again for ‘capital expenditure’ by the military. Why does a peacetime military need so much money? Who is going to invade Sri Lanka? Like the Hambantota port/cricket stadium/airport/wildlife park etc. MR has wasted national wealth on this too – and getting a slice for his cronies. All thought that the latest budget should bring in austerity, but this will not happen. Massive expenditure is planned as usual, with no proposals for repayment. Sri Lanka is about to go the way of Zimbabwe, Greece and a few other similar nations. Only politicians benefit. And, all desire re-election ! Is this Thirukumar Nadesan, the husband of Nirupama Rajapaksa of THE clan and in the inner circle of MR? Was this Thirukumar Nadesan the husband of Mahinda’s favourite niece? 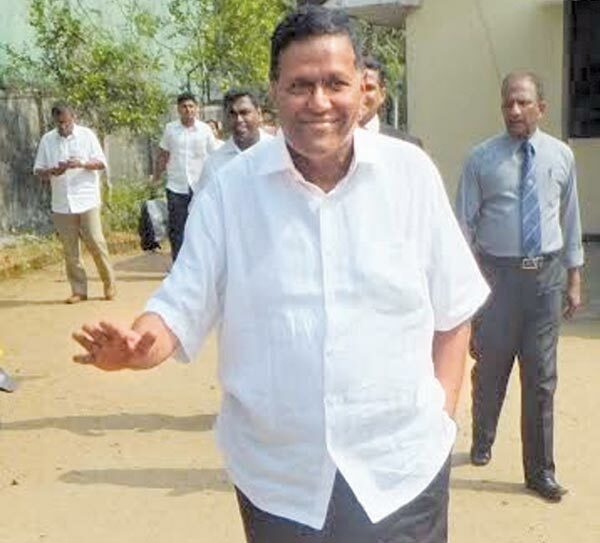 Is he not the guy who was instrumental in bringing Ranil to see Mahinda when Mahinda lost the Presidential election? 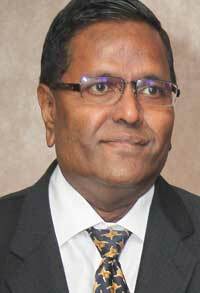 Was Nadesan not the person who was the go between for so many deals with Mahinda’s during his presidency? So whats happening now? Is Nadesan doing this at the request of Mahinda in order to defeat Gotabaya at the Presidential election? Nadesan has been a well known wheeler dealer for many decades… even before RP days. This same guy NAdesan owns the Malwana land in which some one without a name built Rs 245 million worth house and said that was Basil Rajapakse’s house. they jailed Basil Rajapakse. Now, Basil Rajapakse is waiting until Ranil and the butter flies lose the govt to save his house and the land. Has The Vithanage Report anything to do with what is now in the public domain? Who covered up the publication of this report? What a stupid proposal by Gota! Triservices all in one building. Invites disaster. All to do with grabbing money, I guess. Will this not impact on his chances for election? What is the JVP doing? Sleeping?? Hey Kolla! I notice these names you mention are all Tamil. So what about the Sinhalese who ‘fool the people, exploit the country’? We must applaud the Judges who have delivered this classical verdict. It will make possible a cascade of unfair and surreptitious Government transactions exposed in time to come. Welldone Judges we are proud of you. The Yahapalanaya has turned out to be a Yaluwa Palanaya. Oh a what a shame !